The City of Brampton has initiated a Schedule ‘B’ Class Environmental Assessment for streetscaping Improvements in Downtown Brampton. The project limits within Downtown Brampton are Main Street (Wellington Street to Nelson Street East) and Queen Street (Elizabeth Street South to Chapel Street). 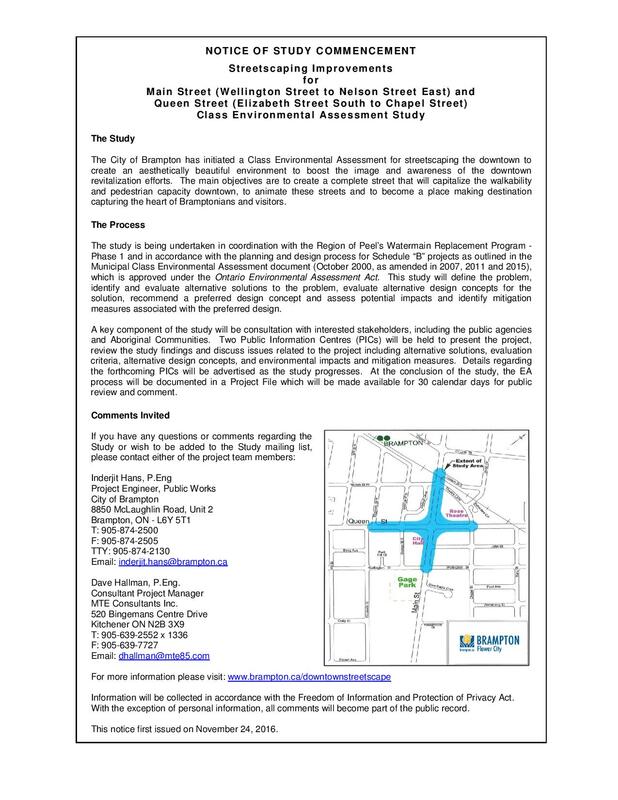 The objective of this Class Environmental Assessment Study is to determine streetscaping improvements that will capitalize on the walkability capacity of downtown Brampton. Proposed improvements will be implemented as part of the Region of Peel’s Downtown Brampton Capital Project ( Watermain Replacement Program) – Phase 1. Attached is a Notice of Study Commencement for this project which provides additional details regarding the project and the process. There will be two (2) Public Information Centres (PIC) held in order to obtain feedback and present the results of various studies as well as the preliminary streetscaping alternatives. You will receive future notices regarding the PIC’s as the project progresses.